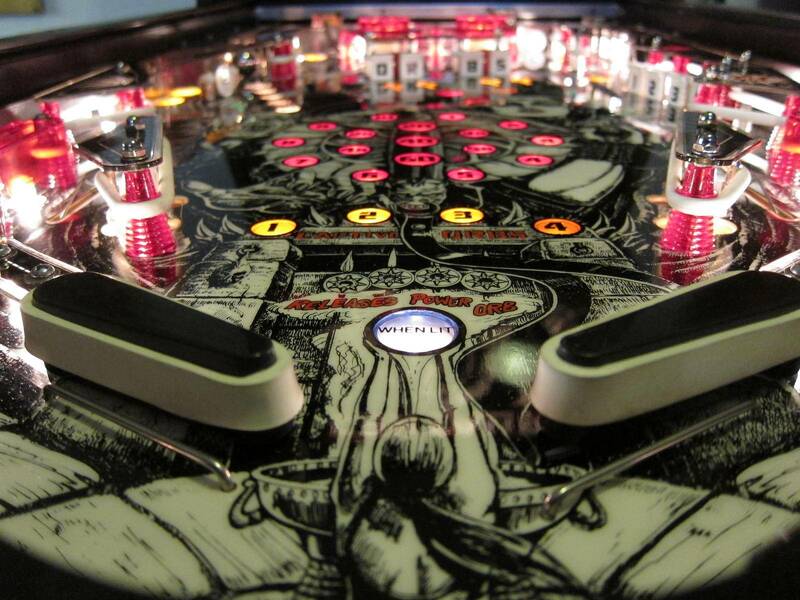 » Forum » All Pinball » Centaur II reborn. Playfield swap complete! » Centaur II reborn. Playfield swap complete! Centaur II reborn. Playfield swap complete! 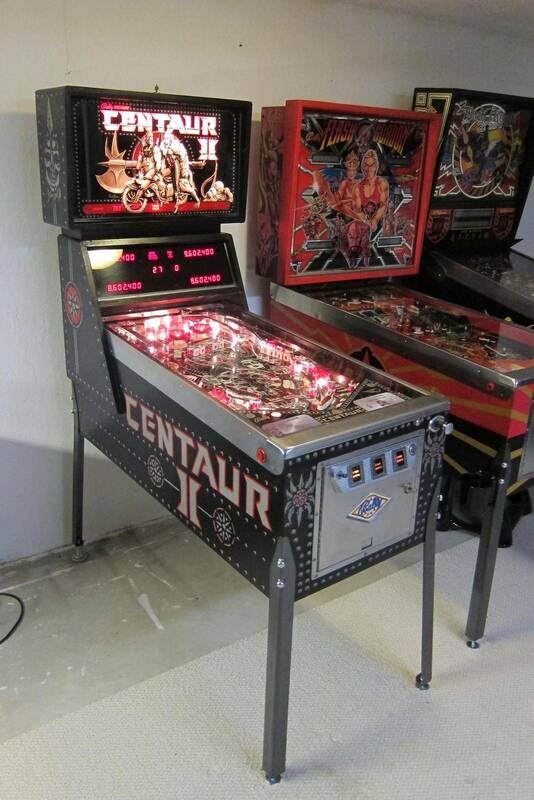 I just wrapped up my Centaur II playfield swap over the weekend and thought I'd share some pics. This is my second full playfield swap after completing Flash Gordon last year and I have to say that this one was quite a bit easier. Only a single playfield vs. 2, less flippers and pops, and a much more simplistic playfield layout.-plus it helps having a swap under my belt already. 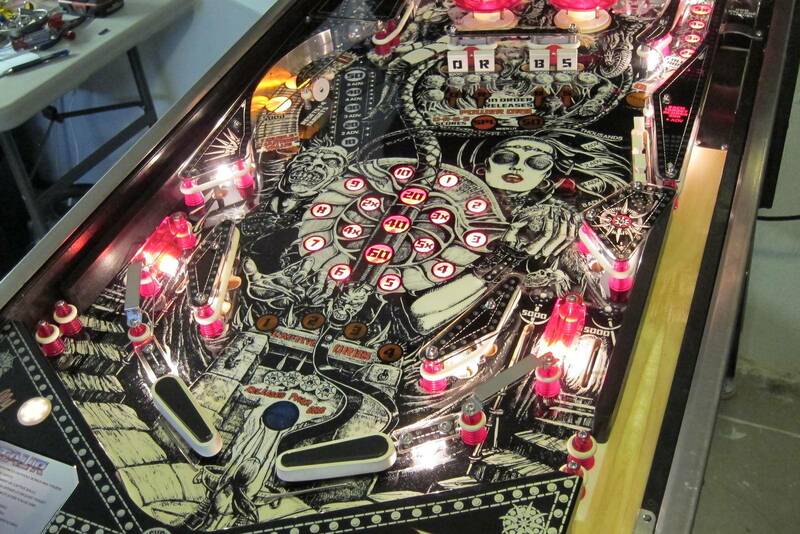 I swapped in a new CPR playfield and mirrored plastic set, new legs, new drops, new playfield posts, new flipper bats,new pop bumper caps and lane guides, and many other replacement parts thanks mostly to Pinball Resource. I tumbled all the metal parts, regrained the rails, and cleaned everything that could use cleaning. I also touched up/cleaned up the cabinet and put on a new coin door sticker and rebuilt the driver board with new caps. I'm very happy with how it turned out. It's amazing how great the artwork is on these classic Bally games! The only thing I'm still considering doing is replacing my lamp boards with Alltek's so that I can add LED's to the inserts.-I get flickering with my stock boards. Great job Mike, looks amazing! You're right about the art on the classic Bally games, can't wait until I'm able to finish my Xenon and Paragon. Until they're restored I just like to admire the details in the artwork. Centaur would look great with LED's, considering them on my Xenon. Looks really nice. I'm looking at tackling this swap soon. I've read that there is an issue with the pop bumper area (the holes were routed too deep?) that required the use of shims and issues with dimple placement. Did you run into these or anything else of note? Also did you run new ground wire or swap over the old one? Approx. how many hours did the swap take you? Thanks! You should bring that to MGC and set it up where it was last year. Very nice machine, that looks beautiful. I am envious of your collection. Nice taste! Some day ill find me a Centaur or II. I read about the issue with the pop bumpers ahead of time but it wasn't an issue on my game for whatever reason as mine came up flush on the playfield? Maybe since mine is a II? I didn't really run into any major hurdles. The biggest piece of advice I'd give you is to not trust the pre-dimpled holes on the repro playfield and measure everything for yourself using your old playfield. 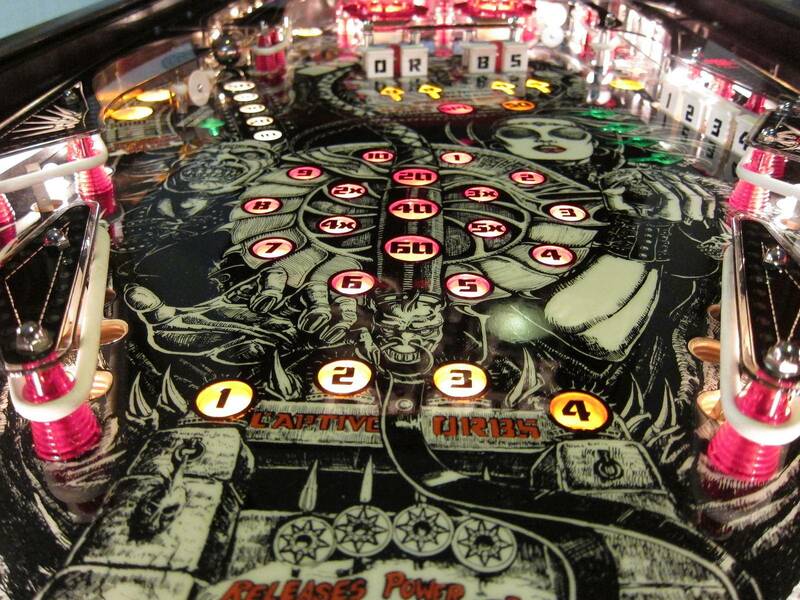 Also pre-drill all of the screw holes/wire guide holes on the top side of the playfield using a brad-tipped drillbit, otherwise you could get some lifting/damage to your new playfield. Just be careful and have patience and I'm sure you'll do just fine! Also, on this swap I re-used the existing ground wire/bulb sockets which saved some time and money. I did all new sockets/ground on my Flash Gordon swap because the older style "44" sockets are crap. The "555" sockets on my CII are much more reliable. In a few spots on the playfield I ran new ground wire because the old stuff got damaged when taking it off the old playfield. WOW!!! Really looking forward to seeing and playing! How does it play? Any issues with the ORBS target causing more STDM drains liek some others have posted? Also, I vote for LEDs. I think the GI needs some retro/frosted reds and the inserts would really pop on Centaur if color matched with LEDs just right. Such an awesome game!!! 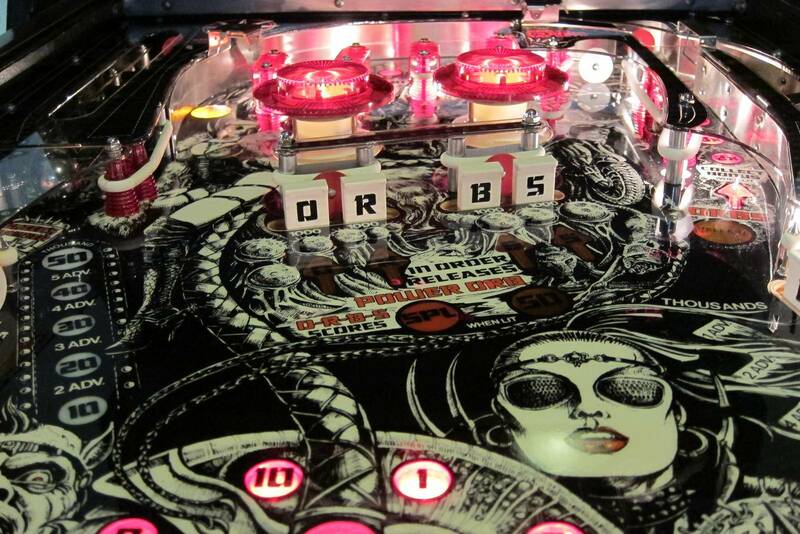 It plays really well but I still need to make some adjustments to the ORBS targets. I don't get SDTM drains but hard direct shots cause the drops to stay up. It's a common problem and I may need to add a second set of springs to the drops or modify the drops to allow them to fall easier. If I put black rubber behind them it works better but I think the white rubber is too bouncy and causes the drop to spring back before it gets a chance to drop. Other than that though the game plays great! I think I will add some LED's in the future. Just need to experiment with what looks good before taking the full plunge and buying the boards. Looking sweet. Love the eighties machines!